In one of the first lessons in creative writing, you learn how to draw from experience when it comes to creating a work of fiction. Even though the narration remains a construct, there is still a core which you can relate to in a way, similar to an actor or actress approaching a character. Many regard this connection as proof that art is essentially biographical, while others claim it stresses the authenticity of art and how it relates to the world we are living in. Whatever your stance on the subject may be, the answer may also show in what ways a creative work can impact our lives, and perhaps also how much validity we assign to it. However, sometimes fiction does not fully establish the connection or convey the message. Although we like to think otherwise, there are limitations to fiction and narration, especially when it comes to topics that are one the verge between dream and reality. 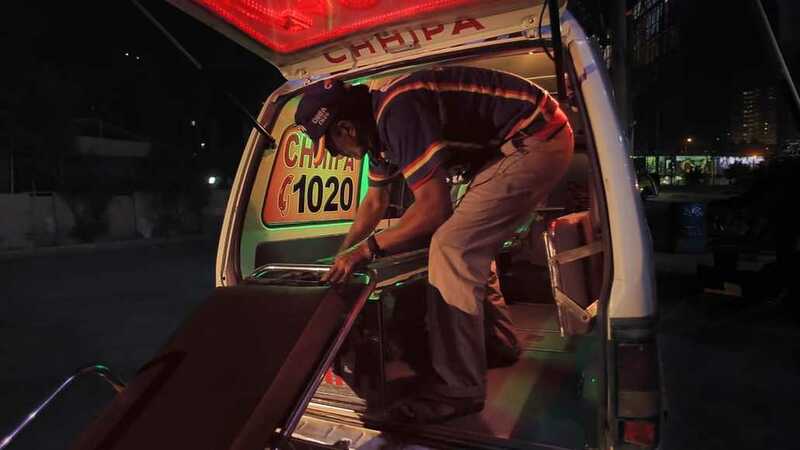 In her new documentary “This Shaking Keeps Me Steady” Pakistan born director Shehrezad Maher explores the world of ambulance drivers in her home country and how they manage to cope with their work. During an interview with Made in Mind magazine about her work, she states how she embraces the “uncertainty” that comes with exploring multiple ways of expression. On her homepage, one can see how her body of work contains installation, films as well as poetry. To her creating art is “a way to move closer to the immediacy and emotional effect music has on me”, to express something which has not been said, something relevant to the world and herself. Regarding “The Shaking Keeps Me Steady” the documentary focuses on various different ambulance drivers and other helpers, their experiences and also their dreams. The structure of the film includes fragments of interviews as well as dramatic re-enactments of the accidents, family dramas and other incidents produced for Pakistani television. Maher’s camera accompanies the rehearsals and the actual filming of some of these episodes while also showing the everyday-routine of the interviewees. Considering her body of work defines itself through the use of other media, her documentary walks on the same path formally and in terms of its narrative. The characters she portrays confirm research, such as a Dutch study by Utrecht University from 2003, dealing with the kind of stress ambulance workers, but also firefighters have to handle as part of their job. According to the researchers, lack of social support and proper instruction leads to a higher risk of work-related stress becoming a health hazard, leading to depression and burnout. In addition, the environment of Karachi, the largest city in Pakistan, poses an even greater challenge, especially when you listen to the interviewees’ stories about shootings, domestic violence and bombings. Interestingly, Maher also embraces the kind of paradox inherent in Theodore Rothke’s poem, whose lines serve as the film’s title. During the course of the film the lines between the stories of the characters, the TV re-enactments, dream and reality become almost insolubly blurred, an aspect reviewer Céline Guenot refers to as “permeable frontiers”. Besides these aspects, the use of long takes, the various images of the inner city of Karachi as well as its outskirts emphasize these disruptions of barriers. It seems as if, as the line in the poem says, this aspect becomes an engine which keeps people going to work every day, following a routine while they bear witness to unbelievable tragedy. The artificial nature of the TV footage highlights how not only this blurry line, but also the kind of need there is for these kind of images. After all, as one of the ambulance workers states, these shows are quite popular in Pakistan. However, the question which comes to the viewer’s mind is whether this is part of a healing process or a symptom of a much more severe condition. Nevertheless, Maher refrains from delivering fixed answers to the condition she witnesses. During the interviews, any viewer can see how talking about these events, from horrible accidents to retrieving bodies from a river, has left deep emotional scars. The severeness of the trauma may have led to the aforementioned blend of memories and dreams, all of which infused by the things these men have seen while being on duty. Dependency, as one of the interviewees says, is “terrible” and he does not allow himself the privilege of asking for it, from support from his relatives or colleagues. In the end, this is perhaps what is needed the most in order to deal with the trauma, but then again asking for help may also seem a weakness in a job which does not allow it. It is truly a vicious circle Maher portrays in her film. In the end, “This Shaking Keeps Me Steady” is a thought-provoking film which will hopefully resonate with its viewer. While staying away from explicit imagery, the stories of her characters and their individual struggles make her documentary a short, but very memorable experience. Perhaps it is not so much an image of ambulance workers and other helpers, but also a picture of a world in which listening to these stories has been neglected too often.